Our culture is changing, and the church seems to be under increasing pressure. But these dangers are not new—and God’s word shows us how to meet them head on. In this book, discover how Jesus’ messages to seven first-century churches in Revelation 2 – 3 is his message to your church today too. 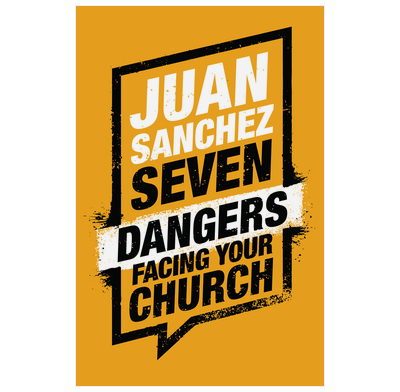 Chapter by chapter, seasoned pastor Juan Sanchez opens up each Bible passage with warmth and clarity. He offers helpful historical details on circumstances faced by the early church, and pushes you to ask the hard questions about your own church and ministry in the light of each message. He turns the tables to show that the most deadly dangers come from within the church, not from outside of it. But more than anything, this book will help the stressed and the struggling to fix their eyes on the risen and reigning Lord Jesus—who holds your local church in his hands. This is a book for every pastor and elder, and anyone committed to playing their part in helping their local church thrive in an increasingly hostile environment. Together, you can live as Christ’s faithful, hope-filled people in a changing culture. 5.3" x 8.5" x 0.4"
Faithful, encouraging, convicting, needed. Sanchez's Seven Dangers is all this and more. He demonstrates how Jesus' words to these seven ancient churches are as relevant to our churches and our hearts as ever. Juan Sanchez makes wonderfully clear the call of Christ to the churches in Revelation, and he helps open our ears to hear that call in the church today. This book doesn’t minimize Scripture’s life-and-death warnings, and it keeps before us the amazing promises of Christ’s presence and power. All this comes in the voice of a wise, experienced, Scripture-saturated pastor/preacher. I read his words with great thanksgiving for the gift of this strengthening exhortation to the church. I’ve heard (and preached) many sermons on Revelation’s “seven churches” but this book brought them alive to me in a new way with a rare combination of precise biblical exposition and precise practical application. It reminded me again of the abiding relevance and cultural timelessness of the Scriptures. May God use this book to awaken us to the fearful dangers inside as well as outside the church, but also point us to the Lord of the church as our only and all-sufficient hope for the future. Very good book throwing light on the issues facing the seven churches in Asia Minor and still for us today in 2018.